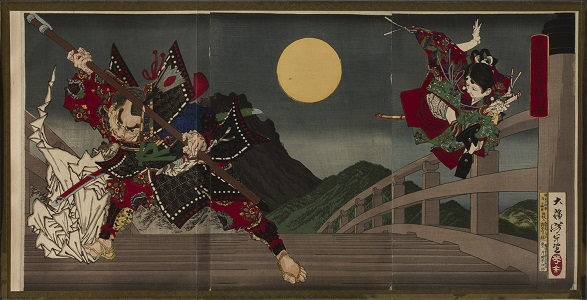 The Twelfth-Century Warrior-Priest Benkei Attacking Young Yoshitsune for His Sword on the Gojo Bridge, 1881, by Tsukioka Yoshitoshi. Color woodcut on three panels (triptych). Mount: 15 1/4 x 29 7/8 inches; Sheet (3 joined printed panels): 14 1/4 x 28 3/8 inches. Purchased with funds contributed by the E. Rhodes and Leona B. Carpenter Foundation, 1989. Image courtesy of Philadelphia Museum of Art, 2019. Discover the brilliant colors and spirited lines of Yoshitoshi, the last great master of the traditional Japanese woodblock print. This exhibition showcases some 70 works from the Museum’s extraordinary collection of Yoshitoshi prints, the largest repository of his work outside Japan.This exhibition is supported through the JFNY Grant for Arts and Culture.